Guys, if you have been searching for the perfect testosterone injected timepiece…your search is over. 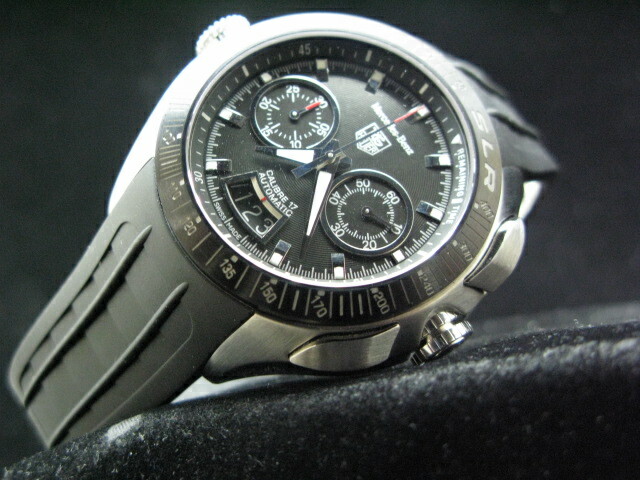 May I present the TAG Heuer Mercedes Benz SLR Men’s Watch CAG7011.FT6013. This exceptional TAG Heuer men’s watch is all the timekeeping you may ever need. The style is undeniably handsome and strong and the functionality is all high quality TAG Heuer. The TAG Heuer Mercedes Benz SLR Men’s Watch CAG7011.FT6013 is presented in a men’s size and is crafted from stainless-steel. The movement is an electro mechanical, so you absolutely get the best of both worlds. It has a scratch resistant sapphire crystal and a bezel, complete with tachymeter scale. The case is 47mm in diameter and is water resistant to 330 feet. The Mercedes Collection was designed to look like the dashboard of the SLR and that feel totally comes through in these watches. They are racy and incredibly finished. The bracelet is crafted from durable rubber and has been fitted with a deployment clasp, for safety. TAG has paid attention to every last detail and it shows. Not only does this men’s watch look substantial, but it also feels that way. The weighty feel of this watch adds to its masculine appeal. The TAG Heuer Mercedes Benz SLR Men’s Watch CAG7011.FT6013 might be the perfect men’s timepiece.